PESA Cheetah 288XR: 288x288 - Fiber Group Inc. The 288XR High Definition Digital Video Routing Switcher handles a full range of digital video signals. From broadcast standards for SMPTE S259, S292, S424 and ITU-R Rec. 601 to traditional NTSC/PAL conversion using our exclusive easySFP modules; the Cheetah 288XR provides brilliant advantages for multi-format routing needs. Signal formats up to 1080p60 can be supported. The frame can support the widest range of rectangular and square matrix sizes. 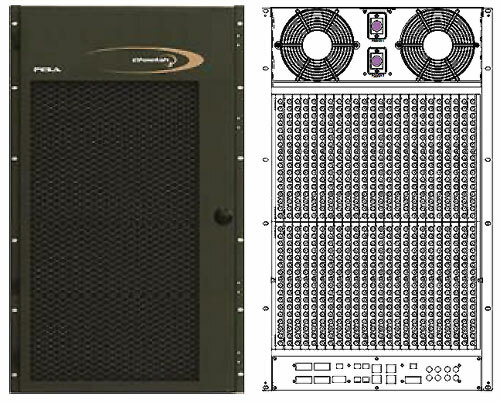 Each 18RU frame can be populated with four 144×144 matrix cards allowing I/O sizes up to 288×288. The matrix card and I/O cards allow many different square and rectangular frames sizes making it a cost effective solution when future expansion is planned. Input and Output cards are based on 16 ports per blade. Optional features include redundant power and control. Frames can be configured using I/O cards supporting fiber, coax, both fiber and coax, or embedder/de-embedder cards to operate seamlessly with our distributed audio switch fabric. Analog conversion for NTSC/PAL can be accomplished using the easySFP module option. The 288XR supports many 3rd party control protocols as well as the full featured PESA control system offered with the 3500PRO and PERC2000 System Control Software. Control options: RS-232, SNMP, or 10/100 Network.